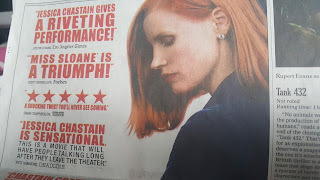 Recently, I saw Jessica Chastain as MISS SLOANE. She took that role and bit into it like it was a succulent, juicy prime rib dinner. And, baby, was it fun watching her take every single bite. Miss Sloane is a lobbyist in Washington, D.C. She's one of the best in the business and one tough opponent. In order to play the game, she sometimes has to break the rules. When she supports background checks on guns, she is for it because of America's gun violence history "...between Columbine and Charleston." When that happens, the big boys try to break her. They can try, but it sure as hell ain't gonna be easy. Miss Sloane is ready. Miss Sloane is no saint. She's not exactly what one would call a "good girl." She has her imperfections and desires like we all do. This makes her a fascinating complicated woman to watch onscreen. Just last week, I had watched THE HELP again. There was Jessica Chastain as the ditzy young Southern wife who hires her first maid and gets a lesson in how to fry chicken. We love this bubbly 1963 character because she hires Minny (Octavia Spencer in her Best Supporting Actress Oscar-winning role) and embraces racial harmony. In the town's caste system, she and Minny are both outsiders. She treats Minny with respect and affection. Chastain was also in the Best Supporting Actress Oscar category for THE HELP. Her performance in MISS SLOANE is yet another display of the her terrific acting versatility. In the 1940s or 50s, this role would've gone to a Barbara Stanwyck, Susan Hayward or Jennifer Jones. In the 1970s, it would've been a Faye Dunaway vehicle. It's that kind of role in a film driven by a strong actress. Here's a movie promo. In the Weekend Arts section of The New York Times on Friday, Nov. 25th, MISS SLOANE got some major space on a page. 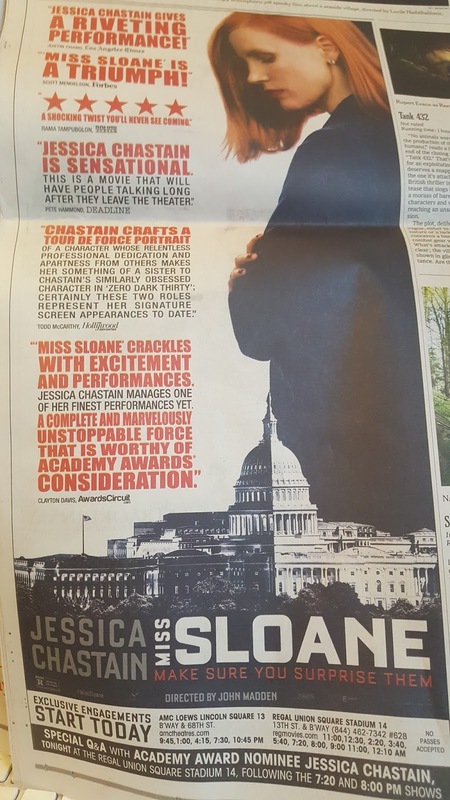 A big ad for MISS SLOANE that included six rave reviews. All were from male critics. 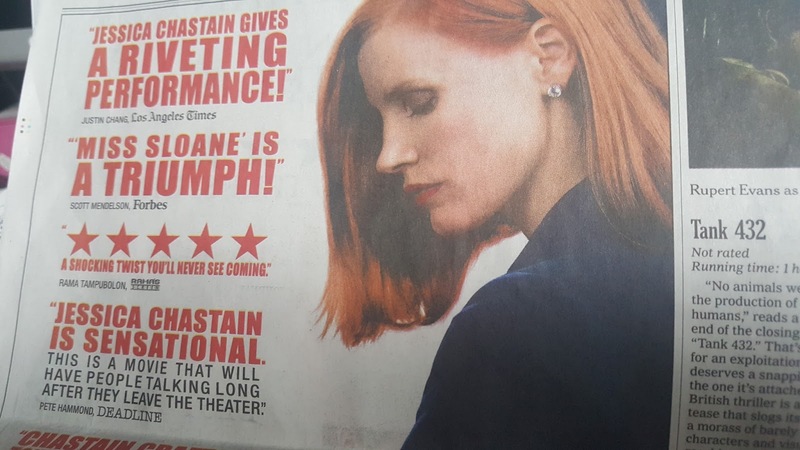 On Twitter, Jessica Chastain tweeted this on Nov. 16th: Hey #nastywomen -- If you love film and are good with a pen, how about becoming a critic? We need female critics to bring balance & diversity." If you've followed my blog posts, you know that I've written several times about TV's lack of race and gender diversity in the field of film critics on network morning news programs, local newscasts and on syndicated film review shows. 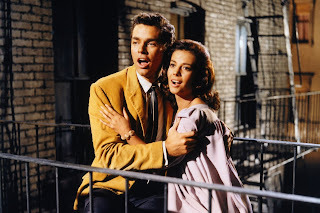 In my New York City years, I've reviewed film on local and network news programs -- but it was never easy to get those bookings. I definitely felt executive resistance when I went for the opportunity. New York City alone is at no loss for good veteran female film critics. I know some of them. I've seen many of them at movie screenings in Manhattan. In 2012, I was half of an on-air team in a film review show pilot. Film review shows aren't new, but this was one was because...it had two black film critics. We got the green light from a prestigious PBS station to shoot the pilot. When I agreed to do it, I pushed for a woman named Mia Mask to be my on-air film review partner. She's African American, great to listen to and teaches film studies at Vassar College. Mia knows movies. I wanted viewers to see that black women -- and other women of color -- can review new movies and discuss classic films. Think about it. When have you ever seen a black female movie critic on TV? Well, the executives wanted the team to be two men. Which it was. And there you have it. By the way, that TV pilot reportedly is "still under consideration." To repeat, we shot it in 2012. The need for Hollywood diversity doesn't just apply to onscreen work. It also applies to those who write and talk about the work and images that Hollywood gives us. The first man quoted in the newspaper ad is the excellent Justin Chang of The Los Angeles Times. Justin can be heard regularly on news radio station KPCC out of Southern California. Every Friday, this NPR station has "FilmWeek," a fine one-hour film review show during the AirTalk hosted by Larry Mantle. (Tom Hanks is a huge Larry Mantle fan. So am I.) Not only is FilmWeek a stimulating, witty, informative hour of non-snarky movie talk, it presents weekly guest film critics in a panel that has refreshing gender & race diversity. It's the kind of diversity in the film review field that network TV has yet to give us -- and it's almost 2017. To hear recent FilmWeek shows on KPCC's AirTalk, go here: SCPR.org. FilmWeek can be heard live on Fridays at Noon Pacific Time. One last thing about MISS SLOANE. It's the kind of entertaining political thriller that I recommend you see again -- just to realize how clever and smart that woman truly is. You'll catch more the second time around. 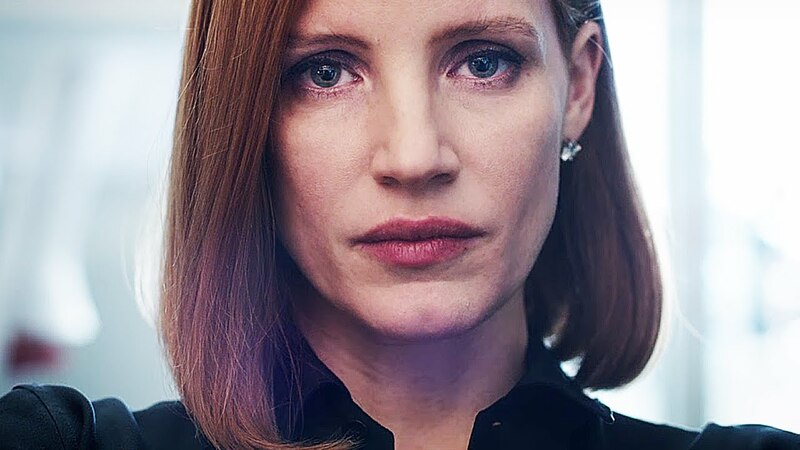 MISS SLOANE is now playing in selected cities. It opens nationwide on Dec. 9th.